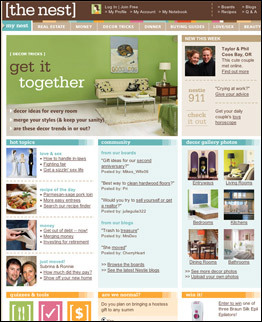 Here's a lifestyle site designed for newly wedded yuppie couples. The Nest  a clever customer-retention device, brought to you by the creators of the wedding site The Knot  covers key topics from design tips for your new home to advice on merging financial assets, to preparations for having a baby. The Nest makes good use of readers' wisdom. There's a "casting call" for couples who want to share their personal stories, plus local guides to restaurants, personal trainers and mortgage brokers that the site's editors cull from submissions.